Angel Crawford pretty much got dealt the trashiest hand from life, which reaches an apex when she wakes up in a hospital after an apparent overdose. Thinking things couldn’t get much worse than being found on the side of the road naked by paramedics, she receives a brown paper bag and a note that changes her life completely. I gobbled My Life as a White Trash Zombie up like a zombie would gobble up brains. I thoroughly enjoyed the whole zombie premise and the fresh take on it. Angel is the poster child for a screw up, but somehow becoming brain dependent turns her into a better person. Go figure. She’s funny and an all around lovable character who you feel for as she struggles to dig herself out of the tragedy that was her life before becoming a member of the walking dead. I swiped some deodorant into my pits, then wrinkled my nose. The stench was in here as well. I could’t seem to smell anything else, but I could sure as hell smell whatever it is that had died. I sniffed around in an attempt to trace the source of it, then on an absurd whim I took a deep whiff of the back of my hand. Oh, gross. It was me! 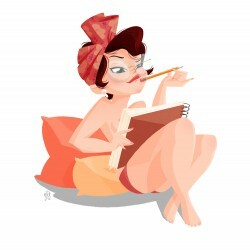 I personally happen to enjoy crime shows like CSI and Law and Order, along with reading the occasional crime novel to stave off paranormal romance overload. So, I was pleasantly surprised to find that this story is centered around a coroner’s office, which one would not have picked up on from the book’s back cover blurb. Diana Rowland‘s background in forensic pathology is prevalent throughout which made White Trash Zombie even more engrossing for me. I loved her brilliant depictions of crime scene procedures, while maintaining a lighthearted quality that kept the story moving and rather upbeat. There is not a whole lot of heat, but there is a romantic element that definitely had you craving a bit more. However, considering the fact that there is a zombie involved you can’t help but be a little apprehensive about the “a bit more” nonetheless. 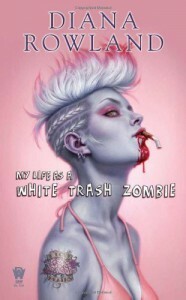 My Life as a White Trash Zombie was a wonderful read and I can’t wait to get started on the second book of the series, Even White Trash Zombies Get the Blues. Take note, it is very graphic in detail as far as different levels of the undead, so it might not be for everyone. But if you’re a fan of Patricia Cornwell’s Kay Scarpetta series and/or have a warped obsession with zombies like myself, you might want to consider giving White Trash Zombie a try.